These two conditions are similar so far as the Symptomatology is concerned. The Vasomotor or Catarrhal rhinitis is attributed to vasomotor imbalance (changes in the caliber of the blood vessels) and allergic rhinitis to a specific sensitivity reaction. ü Atmosphere with quick variation of temperature. 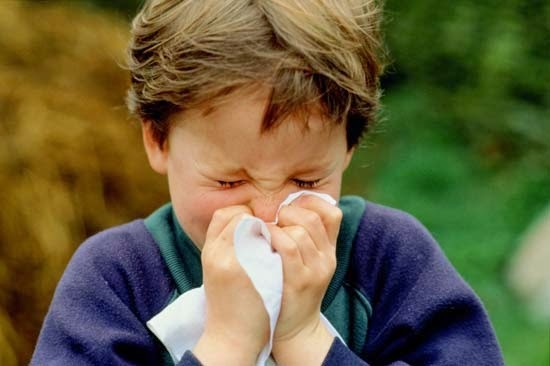 ü Allergic rhinitis arises from sensitivity to house dust, pollens, fungal spores, proteins, dandruffs of animals, etc. ü There is hereditary tendency also. Ø Both conditions produce triad of nasal obstruction, bouts of sneezing and excessive nasal discharge which is usually watery but occasionally thick and mucoid. Some patients suffer from conjunctival irritation with irritation and watering of eyes. Nasal mucosa is swollen and slightly bluish in color. Ø The early symptoms are chilliness, languor, muscular pains and slight fever. Ø Stuffiness and dryness of nose and soreness with frequent sneezing. Ø Sense of smell and taste may be impaired. Ø Nasal discharge, which is at watery and profuse, becomes thicker later on. Ø Often there is sore-throat, husky voice, dry cough, worse at night followed by high fever. Ordinary Rhinitis should be distinguished from allergic rhinitis. The latter occurs at all times of the year, and the former is due to the nervous of local causes. Ø Sinusitis, frontal antrum and sphenoidal. Ø Blocking of eustachain tubes, causing temporary deafness. Ø And occasionally bronchitis and even broncho-pneumonia. ¬ The patient should be put to bed and isolated. ¬ As the nasal discharge of first two days is highly infective, the linen so used should be disinfected. ¬ The head should be kept warm. Ice and too much cold water forbidden. Aconite : At the commencement of the disease when the patient feels that he is catching colds; dry state and no discharge; the nose id swollen from congestion; and is try and stopped- up and this stoppage is apt to change from side to side with a tingling and burning in nose and throbbing frontal headache; may be sneezing also, better in open air. There might be fever also. (Camphor is the first medicine to be tried). Nux Vom: Also at the commencement, when the nose is dry or fluent throughout the day and stopped up in the evening; rough scrappy throat with dry cold and constipated bowels. ( Ipecac if the Nux fails). Arsenic Alb: For winter colds with thin, watery excoriating discharge with a feeling of nose being stopped-up. Sneezing does not relieve the throbbing frontal headache. Arsenic Iodide: (After meals) is indicated, when burning in nose and throat is marked. Sinapis N is indicated, when there is dryness and no discharge with head in nose. Allium cepa: profuse discharge of bland water from eyes with burning water from the nose indicates this remedy. Terrible laryngeal cough may also be presenting some cases. Belladonna: Headache worse from mention or lying down; dull pain in frontal sinuses, cerebral excitement and swelling in throat are the chief symptoms. If recovery from catarrh has been ‘impeded’by fresh exposure with pain over the eyes (right side) and face flushed. Mercurius Sol : The discharge is thicker and acrid in character and is fully established ans is aggravated in damp weather. Also when the discharge is thin and watery from tamp, with soreness and rawness in the nose and throat. Euphrasia: Indicates discharge of burning water from eyes and bland, thin discharge from the nose. Justicia: Stands between Cepa and Euphrasia in cold. Pulsatilla: Is indicated in the advanced stage of cold, known as “ripe cold” . The discharge is thick, yellow, mucopurulent and bland. This is relieved by cool air and aggravated by warmth; or when catarrh results from cold and the patient can neither smellnor taste, or if catarrh has been checked by fresh exposure. Hydrastis: is similar to pulsatilla, but there is more burning, rawness and constant desire to blow the nose, when cold has settled at the back of the nose and throat, pulsatilla cold pulse sneezing requires cyclamen. Camphor: should be given in the first and initial stage of cold, when nose is stopped-up and dry, and the inspired air feels cooler than usual. It is really indicator before Aconite. Gelsemium: This remedy can break-up a cold. It is indicated when there is congestion of head, ‘hot ‘ fever, and chillness. The patient is dull and weak, and chill runs up and down the back with a watery, excoriating or bland discharge from nose along with sneezing. Cold brought on by warm relaxing weather especially indicates it. Natrum Mur: Cold with watery, transparent discharges causing blister-like eruptions about mouth and nose, which burst and leave thin crusts and scabs. Entire loss of taste or smell exists (sinusitis). The complains are worse on going into open air, and exertion; great dryness of posterior nares watery, clear, frothy discharge from nose. Sticta pul: Constant desire to blow the nose, though nothing comes out; stuffed feeling at the root of the nose and dryness of mucous membrane. Sanguinaria nitrate for acutr colds with sneezing and profuse discharge in posterior nares. Bellis P. For exposure to wet and cold, when over-heated; or from ice-drinks. Lycopersicum and Acid Sarcolactic are remedies for allergic rhinitis. Pulsatilla, Natrum Mur. With occasional doses of Bacillinum 200 may cure the allergic form. Symptomatic Homeopathy medicines helps for common cold and coryza. Its good to consult the doctor to get symptomatic treatment.